The average cost of a bad hire can equal 30% of the individual’s first-year potential earnings. This is according to the US Department of Labor. Also, a wrong hire led to a negative impact on clients for 22% of companies, according to another report. Well… these statistics show how bad hiring can jeopardize your business. Not performing adequate reference checks. Yet, the most common and primary reason is not evaluating a candidate thoroughly, which should be based on the parameters that are critical to your business. And, this holds true when it comes to hiring a logistics manager as well. After all, how can you hire the right candidates if you don’t know what makes them the right fit? Just asking a couple of generic questions, such as about experience, is not enough. It cannot guarantee success. You need a hiring checklist that has the parameters defined clearly. Every candidate must then pass through the list, point by point, before being considered. And there should be no deviation or exception if you’re serious about hiring logistics managers. But, by now you must be wondering what parameters should be included in the checklist. And, how could it ensure the successful hiring of a logistics manager? Read on to find the answers. The first thing you need to look for is whether the candidate has great people management skills. Some managers only focus on their defined daily operations. But, they can’t contribute to a business’s growth. You thus need someone who can think strategically, take the lead and focus on teamwork. This will help you achieve your company’s vision. Leadership – They should lead by example. They must be clear on the team members’ objectives and value their contributions. Also, they should be able to gain their respect and focus on developing the workforce. Communication – They should have effective communication skills. This is needed for the customers and team members to understand them. Most importantly, logistic managers must have great listening skills. It is required so they can listen carefully and understand what others are saying. Team building – They should be able to motivate employees to work together. They must thus communicate effectively, participate fully and delegate work efficiently. Furthermore, they must give the appropriate support and guidance when delegating work. This is important if you want your company to achieve the desired result. Interpersonal skills – They should have great interpersonal skills. This includes assertiveness, taking responsibility and being accountable, self-management, good manners, and adaptability. Focus on building successful relationships with both customers and team members. A well-planned and foolproof process makes a company successful. But, it has to be dynamic and not static. You should analyze the results of a process and tweak it accordingly to reach greater heights. So, ask the potential logistics managers whether they have redesigned any process. Also, what impact has it made to their employers? Ideally, each candidate should be able to review a customer’s needs and service levels. They must then increase the speed of the cycle times. They must also be able to deliver superior, on-time delivery. You can also discuss your current business scenario or the challenges you face. You can then ask them how they would redesign the process. Your manual route planning process takes up a lot of productive hours. Yet, it still cannot guarantee 100% accurate routes. It might also lead to delays in deliveries, which annoys your customers. Ask the candidates for a solution to the problem. What can they do to streamline the process? For example, a vehicle route planning software could improve the route planning process with ease. 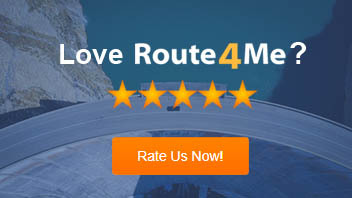 It automatically calculates and provides you with an optimized route within minutes. And, it does so with zero route errors. Do the logistics managers suggest such a solution? Do they still suggest static or dynamic route planning? Do they insist on tweaking the planning process, but still stick to pen and paper? If the latter is true, then it would undoubtedly be a bad hire. You need someone who can redesign a process and set the company in the right direction. Problem-solving skills are necessary for every manager across all industries. But, for logistics companies, real-time problem-solving skills are most important! We can show the validity of this statement with an example. One of your drivers is behind schedule due to a sudden breakdown or any other reason. But, you cannot compromise on the delivery deadlines. How would the logistics manager candidates solve the problem? Will they inform the customer in advance that the delivery would be a bit late. If so, would they explain the reason for the delay? Will they reassign another driver who is close to the customer’s location in real time? If so, would they do so with the help of routing software? The latter is the best solution to the problem, but you might not know about it. This is especially the case if you still plan routes with pen and paper. But, the logistics manager needs to come up with such a solution. Don’t hire someone who is unaware that there is a tool like routing software can help them manage problems. IT plays a key role in logistics. It is also an important tool for dynamic route planning and vehicle or driver management. Therefore, technological skills and an understanding of complex programs are essential for logistics managers. The candidate must also know that technology can improve competitiveness and operational efficiency. They do not need to have programming skills. But, they must be able to use their analytical skills to get the best from the system. This is needed to make the operations run smoothly. And, if they do not have IT skills, you’ll miss out on opportunities. This could be fatal to your business. For example, if they don’t have such skills, they cannot operate a route optimization software. Although, such software doesn’t require advanced skills, but basic knowledge is required. And, if your logistics manager doesn’t have that, your route planning process won’t improve. It will thus always remain time-consuming and inaccurate. And, that’s not what you would like to have in a logistics manager… right? The skills mentioned above are mandatory for all logistics managers. However, there are other skills that you should look for to ensure you hire the right candidate. They must have a proven track record of accomplishments and achievements. They should have executed cost containment tactics. They must have the primary logistics management skills covered. These include warehousing, transportation, order fulfillment, trade issues, distribution and third-party management. They should be able to forecast and plan ahead for the potential needs of the company. They should have the ability to analyze risk. For example, they must be able to analyze the risks inside planning and routing software before sending a truck on the road. They should also be able to create dummy routes and see how well they perform with good accuracy. They must have a holistic understanding of supply chain management. They should have strong written and verbal skills and understand logistics metrics. The ability to prioritize in order to be successful in the position. So, what skills do you look for when hiring a logistics manager? Have we missed any points here? Please feel free to leave your comments below, we’d love to hear from you. Thanks for sharing the valuable information. I think with the enhancement of Information technology, software have become an integral part of the logistic business. Its no doubt they are helping & improvising a lot in logistics business. With all new software like Last Mile Delivery, Logistics Management, Logistics Tracking, Route planning, Line Haul, Vehicle, fleets & Drivers tracking software, it makes a secure transportation of goods from all across the globe. Moreover only because of such latest software companies like Fedex, LogiNext are able to offers an ultimate Logistics services to their clients. I liked how you pointed out that the ability to problem solve is an important trait in a logistics manager. If I were a business owner looking to outsource some of my shipping, I’d want to work with someone who is proficient enough to be able to problem solve and help overcome unforeseen obstacles that arise on a daily basis. What do you suggest is the best way to determine if a logistics manager has that quality?